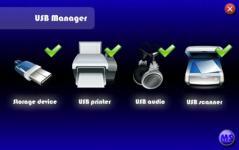 USB Manager is the perfect tool to have on hand If you’re someone that has a whole bunch of USB devices connected to your computer because it gives you the opportunity to manage all of them in one handy and convenient place. It comes equipped with a super easy to navigate interface that can be used by even the most basic computer user and allows you to control who’s allowed to manage what devices with just a few quick clicks of your mouse. It doesn’t slow down your system in the least when it’s running and it works flawlessly on all versions of Windows, making it the perfect tool for everyone with USB device management needs. - Gives you the opportunity to manage multiple USB devices at one time. - A simple to navigate interface that lets you know how many connected devices you have and what type they are (storage devices, USB printers, USB audio items, USB scanners, etc.). - Lets you enable and disable devices with just a single click. - Gives you the ability to restrict access to some of the USB devices with a dedicated password if you’d like. - Sits quietly in your system tray, ready to use whenever you are. - Doesn’t slow down your computer down in any way whatsoever. - Works flawlessly on all different Windows versions. - Lets you use hotkeys if you’d like to be able to run the application with your keyboard.